I am from Fayetteville and have been in the medical field for over 20 years. I have a supportive family with two wonderful children, Anthony and Savannah, and a boyfriend, Joey. I have been working at Professional Optometry for three years, first as an optometric technician and then at the front desk. 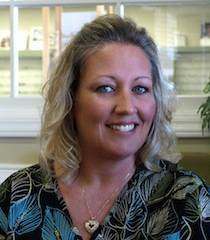 I am therefore knowlegable about all aspects of your eyecare including insurance benefits. Please feel free to contact me with any questions you may have about your visit to our office. It is my pleasure to be able to work with such a great staff and I look forward to serving you.